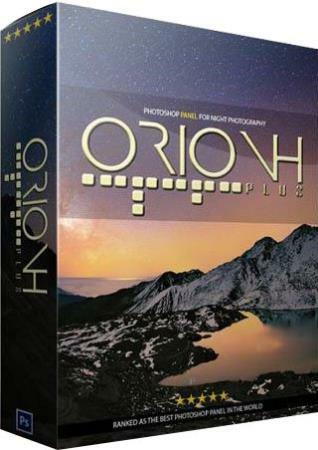 OrionH Plus также понравится любителям цифрового искусства, для которых были созданы полностью автоматизированные процессы, способные искажать сцену, чтобы полностью реалистично показать тени и блики. - Thanks to Orionh Plus you have the micrometric control on details, colors and lights! - Thanks to technology TMMLC (Tonality Masks Micrometric Light Control) in fact you can select micrometric lights, shadows, and midtones of warm and cool colors. - AUTO Automatically process the Milky Way, it is at its best when photos with no adjustments. - CONTRARY / BOOST CONTRAST 3 different levels of application. This function is used to "extrude" the way lattea.D & B (Dodge & Burn) to manually counteract the dark regions and luminose.CA (Auto Contrast) contrasts the dark and bright areas. - Darken / DARK SKY This function always divided into two different levels need to darken the sky around the Milky Way. - STAR FILTER / FILTER STARS Select stars (select all points of light) .Filtra to mitigate the stars to bring out the nebula. - MITIGATE LIGHTS / LIGHTS KILLERLights number: Delete the lights on the whole working exclusively on high luci.Inquinamento: Eliminates light pollution making it consistent with the rest of the sky. - Saturation Controls the saturation of the picture. - REMOVE DOMINANT / COLOR STOP is used to eliminate color casts. - NOISE REDUCTION Noise Background / Background Noise: attenuates the noise due to high iso. Color Stains: removes color stain. - HOT PIXEL Divided into 2 intensity, it removes all the dots due to the sensor noise by improving the quality of foto.La first intensity can also be used on the stars; second only to the background. - STACKING A driven and automated process to reduce the picture noise using the technique of Stacking. - CREA-STAR TRAILS / STAR-MAKER TRAILS Automates the Star-Trails creation process. - Startrails FLUID / FLUID Startrails Divided into 4 intensity, liquify the Startrail in such a way as to make it fluid and homogeneous making in the context of the very delicate lines and shaded. Polaris (Polaris center collapse) to be used only on the narrowest part of the polar to hide as much as possible the fluid effect on absolute black. - EXTRACT / extract , the same as before only much more precise and heavy in color extrusion passages on the tri-color (color star / stars color) and four-color (saturation stars / star saturation). - DOMINANT / COLOR CAST extracts the colors of the stars based on the choice of the three RGB colors (all 3) can be applied. - SHADES '/ TONALITY Change the color tone on the stars. - STARS AND LIGHTS / LIGHT STARS & uniforms Lights / Lights Flat generates a flat on general lighting by reducing moire. Reduce stars / Minimum Stars gets rid of the finest trails and small to help eliminate the moire effect. - NOISE REDUCTION / NOISE REDUCTION Noise Background / Background Noise: attenuates the noise due to the high iso.Polvere and scratches / Dust and Scratch: eliminates artifacts and the like created during the process. - HOT PIXEL Divided into 2 intensity, it removes all the dots due to the sensor noise by improving the quality of the picture. The first level can also be used on the stars; second only to the background. - CA (Auto Contrast) contrasts the dark and bright areas. - STAR FILTER / FILTER STARS Select stars (select all points of light) Filter divided into 4 intensity with different effects, similar to the filter of the stars milkyway section but acts in general and lightly. Saturation / Saturation Saturate the stars. - REDUCE GRADIENTS / GRADIENT KILL Delete generally gradients. - NOISE REDUCTION / NOISE KILL acts on the picture noise with various functions. - SIMULATIONH-alpha in 2 intensity acts on channels extrapolating the red signal simulating precisely an h-alpha channel. OIII in 2 intensity acts on channels simulating the third oxygen. - POINTED STARS / STARSPIKES Simulates the spikes to the stars in various intensities. - EXTRACTION This feature is able to extract which serves light and shadows automatically selecting and recognizing where there is shortage of light and / or shadows. - CONTRAST These functions are divided into 1,2,3, and emphasizes hrla. The numbers indicate the contrast volume that will go to act on the picture, hrla instead makes an automatic selection of the lights and shadows going to separate them, emphasizes serves to concentrate most of the contrast range of action acting more violently on the file. - ORTON Divided into 3 numbers indicating the volume of action orton effect, the word "color" acts on saturating colors and just working on them, "magic light" instead gives mystical atmosphere and fabulous in your photos. - RECOVERY Divided into "high lights" and "shadows" by selecting one of them will recover overexposed highlights or underexposed shadows based on the selection. - SPECIAL FX This function is divided into three action serves to make, based on your selection, a sunset effect, dawn light or turn a photo into IR or from day to night. - Lambent This function serves to realistically create a light-effect painting or drawing with light by selecting a text and also "draw" in the form of light-painting. This work also creates shadows and lights to make it look like the realistic effect. - DARK MOOD BEAM This work turns into a completely automated your photo into an epic scene, the arrows are used to choose the direction of the light beam. - BLIZZARD Turn fully automated your picture in a scene from the snowstorm, no matter if it was taken at noon in midsummer, the effect will be realistic. - Divided into 3 actions, it serves to give clarity to your photo, the higher the number the higher the degree of action on the photo. - CONVERSION / FISHEYE / LITTLE PLANET- are specific functions to create panorama, fisheye effect and little-planet. - WHEEL / THINK are the functions you need to rotate, move or flip mirror your panoramas. - MASKS OF BRIGHT ' are used to select the lights, midtones and shadows. Depending on the choice, you can adjust the mask micro metrically. - MASKS OF COLOR ' are used to select the colors, divided into cool tones and warm colors: you can automatically switch the lights, the midtones and shadows of colors. Depending on the choice, you can adjust the mask micro metrically. - HSL They are used to change the saturation, luminance and hue of each color. - They are used to change the saturation, luminance and hue of each color.